Rumours have been circulating like wildfire claiming that Robert Pattinson has finally moved on from his ex Kristen Stewart with singer FKA Twigs and it looks like we may have got the confirmation we needed yesterday as the pair were seen holding hands while walking along Venice Beach. 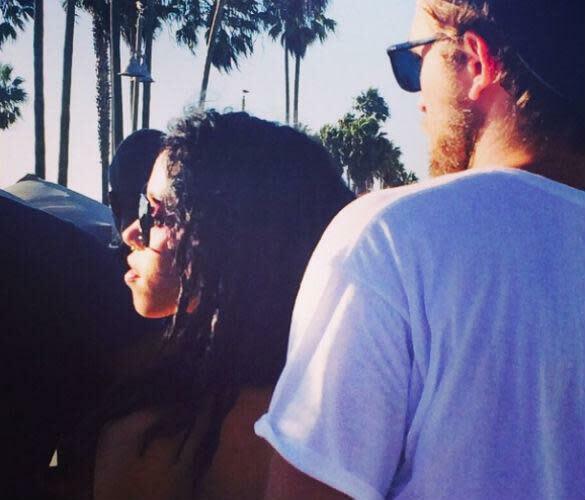 Pattinson, 28, and FKA Twigs - real name Tahliah Debrett Barnett - were seen looking at ease with one another, laughing and joking, as they walked along the Venice Beach strip. The duo seemed to want to keep their outing a private affair as the Twlight star maintained a low-profile in a plain white tee, a baseball cap, a pair of shades and a growing beard, while Twigs, 26, who is well known for her outlandish sense of style, looked casual in a string bikini top and shorts. Earlier this month, the singer was asked about her relationship with Pattinson after it was announced that she had been nominated for the prestigious Barclaycard Mercury Prize. When asked about their romance, she said: "I think that I like to keep my personal life personal, but I'm really excited to be here today and to be talking about my music and my album." Judging by pair's body language in the new pics, things certainly seem to be heating up between the stars. "It's the real deal between Rob and Tahliah," a source told The Sun last month. "They had been able to keep their relationship a secret until recently, but they're already smitten. "He's been taking her on dates for the last month or so, and has even flown her out to stay with him in New York. He also loves going to her gigs."